A very rough outline of the city! confidential and to myself so that I can execute them later. However, this concept is too big for me to ever be able to execute myself and I want to initiate some actions (even just discussion) on this mega-project right from now so that it could take shape sooner, if ever at all. Initially I didn't want to make this plan public. So, I had created a Google Document, made a rough draft of my idea or vision and added my talented and capable friends as contributors to the document, so that they could offer suggestions, add their own visions, and finally help me refine and construct a full fledged plan. However, this idea turned out to be impractical as my friends had their own responsibilities and obligations to meet. Therefore, I am bringing forth this idea into a public place. 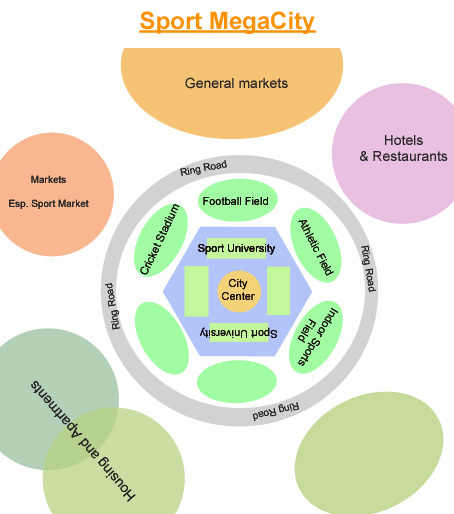 To build a large and sophisticated sport city in Nepal which is backed by sport tourism. The city will be among the most eco-friendly and well managed cities of the world. Like the “IT City” Bangalore, “Entertainment’s Capital” or the Resort City Las Vegas, and so forth, this dream city will be “Sport’s Capital” of the world. Trading Sport Equipment, Materials, and so on. Fair employment based upon people’s skills and capacity with latest remuneration scheme and human Resource Management Practices. The project's financial needs are immensely, literally immensely, huge to be projected in advance. The project has to meet financing requirements through different strategies and financing models. Banks and private sectors’ investment will not be enough. We need to attract investors from abroad as well. We need to bring in the required expertise as well from abroad. The city’s financial requirement can be expected to exceed $100 billion. 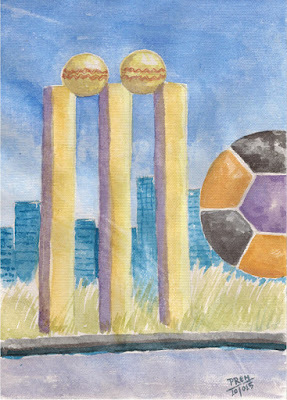 Conceptual Art of Sport City! Around it will be the Sport Universities and Research Centres. Sport Universities will impart both theoretical and practical sport related education. Research Centres will be the bodies that will conduct the research, especially to bring about new knowledge, find new ways to approach sport and sport education, and the like. They can suggest both theoretical and pragmatic knowledge to the universities. Research centres and Universities need to be highly sophisticated covering large area that can provide plenty of space to conduct academic activities related to sport. Beyond the universities and research facilities, will lie the stadiums and playgrounds. All the facilities will possess the state-of-art infrastructure with latest engineering techniques and tools. Every structure needs to be exceptionally good, durable and environment friendly. Further outside will be a ring road (large 8 lane road) which will connect the outside markets and residential areas to the city's main attraction! Beyond that will be sport markets, markets and residential areas for the in-habitation of people. 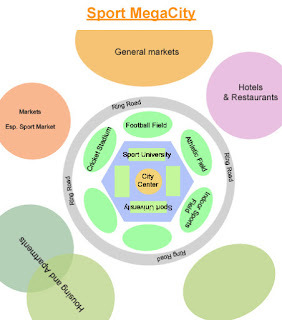 All kinds of trades will be exercised over there and sport markets will features all kinds of sport equipment for wide ranging sport activities. This is the brief concept for now, and it doesn't even sound close to a megacity as of yet. However, this is something I think we need to do, in order to propel Nepal into a path of sustainable development. Nepal Government is planning to create a highly sophisticated ultra-modern city in Surkhet. It is reportedly a 20 year plan. How about converting it into a sport mega-city? 1. The plain and barren land will facilitate the layout of the infrastructure in the beginning such as the road, electricity and water supply, drainage pipelines and the like. 2. The large open spaces are necessary for building the stadiums and sports fields. It would be more economical to buy land plots in these areas than anywhere else. Also, the construction of a modern city in the western Nepal can bring about a balance with the east in the development of the country. Thus, the people of western Nepal can get access to the sophisticated market and services more easily and quickly. In the meantime, I would like to know your opinions on this matter in the comments below! Also, anyone who want to contribute to this project can contact me!